Each month, current ETAs are asked to share highlights of their activities at their sites. This month features ETAs from Group 1, located in Sumatra, Bangka, and Central Java. What follows is a sampling of how they got involved in their communities during the first full month at their sites. 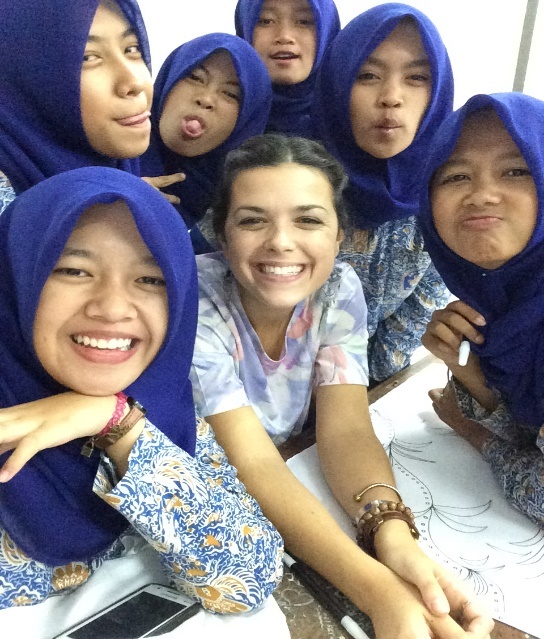 The photo below is of students at SMKN 3 Magelang teaching ETA Savannah Trifiro how to design batik in September. This was during the students’ design class. Before this photo was taken, the students showed her the correct way to trace her design onto a white fabric. Savannah Trifiro learns how to make batik. Yogyakarta, Central Java, 8 October 2015 — Rock Climbing with Teladan Hiking Association: A recreational outlet for adventure. After a week of intensive mid-semester exams, the students of SMAN 1 Teladan, Yogyakarta unwound with a recreational trip to the local rock climbing wall. 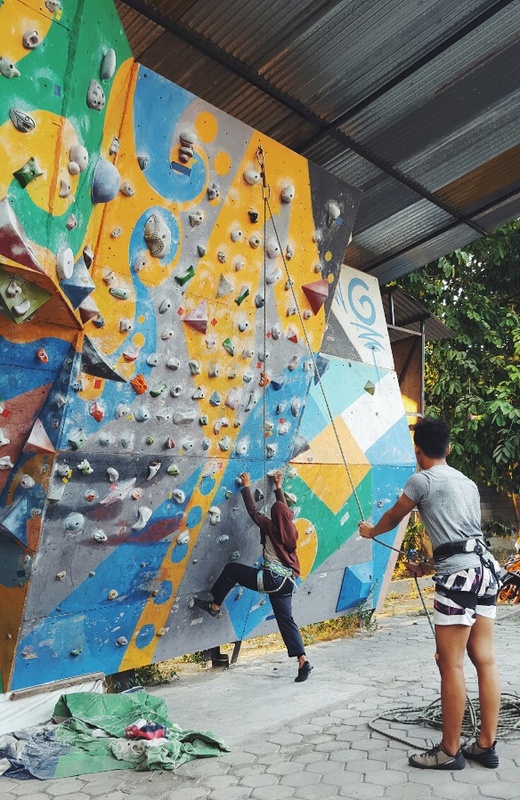 English Teaching Assistant Julia Xia teamed up with SMAN1 student alumni to organize a rock climbing trip for that students grade 10 through 12. All students were belayed by either Julia or other belay certified alumni, and students were able to safely experiment with a new sport. Students at SMAN 1 Yogyakarta go rock-climbing. 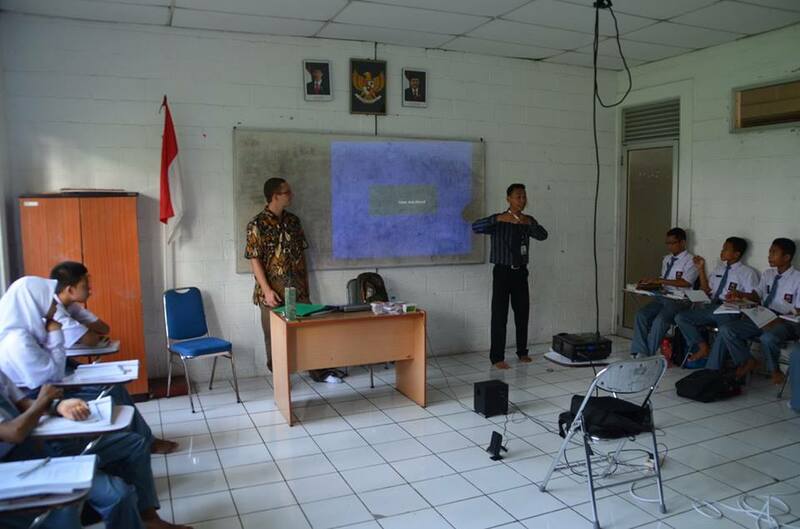 The photo below is from the 27 September meeting of the Language Learning Club at Universitas Lampung. Both Bandar Lampung ETAs, Rebecca Selin and Ramon Caleon, attended this meeting. The Language Learning Club is open to all university students in Bandar Lampung and holds weekly meetings where students hold foreign language discussions. Most students focus on English, so Rebecca and Ramon are always welcome guests. At this meeting, the ETAs led group activities and discussions in English. ETAs Ramon Caleon and Rebecca Selin attend their first meeting at Bandar Lampung’s university-level Language Learning Club. On Sunday October 11, Ramon Caleon participated as a judge in a speech and storytelling competition for Bandar Lampung’s Language Learning Club (LLC). LLC is a community of individuals (mostly university students) who are interested in learning foreign languages, such as English, Japanese, French, and Korean. Even though it is only in its second year, LLC already boasts 30 members from 6 different universities across the city. The club meets every Sunday, but this Sunday was particularly special, since it organized its first competition for its members. This competition was held in Universitas Lampung and consisted of both speech and storytelling components. The speeches revolved around the themes of the environment, education, and politics, with topics including rubber trees, students’ morality and taxation. Contestants’ stories were just as varied, ranging from romantic love to a fable about a fox and goat. Ramon was quite content to hear the opinions and anecdotes regarding a variety of topics from Indonesians in his age group. Contestants were judged based on their confidence, pronunciation, body language, and matter of speech. Each judge also offered constructive criticism to each of the contestants. Finally, the competition concluded with a theater production and a group discussion. Ramon was able to give advice about how to improve members’ confidence in speaking with native speakers and suggest some ways for them to practice their English. Overall, it was a successful day of cultural exchange for all. 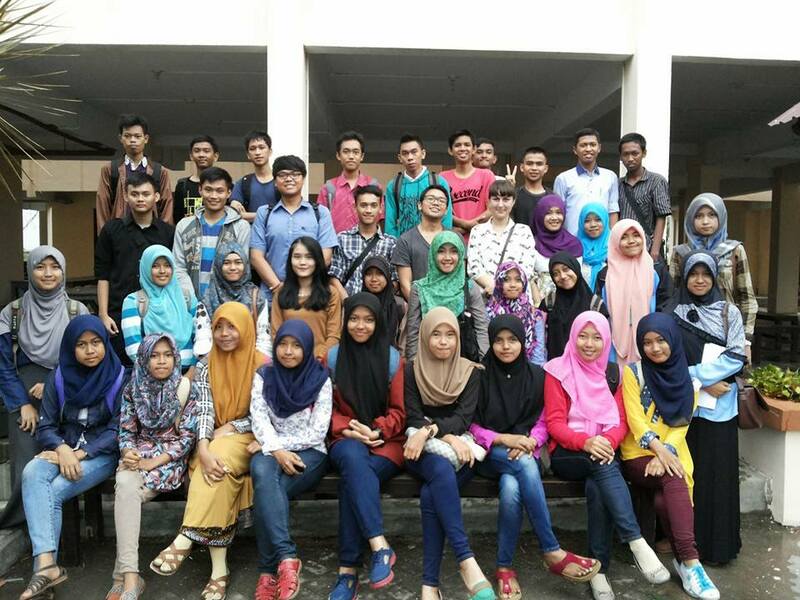 ETA Ramon Caleon, seated in the center, with Bandar Lampung’s Language Learning Club (LLC). English Club is held three times a week at SMA CTF, and is usually led by an English co-teacher and ETA Christopher Linnan. The students practice public speaking, story-telling, and play games together to practice their English. Sometimes they compose speeches about current events and sometimes they play Scrabble together. The main purpose of English Club is to improve the students’ English language ability and their confidence in speaking it. Recently, several of Mr. Christopher’s students entered a regional English language speech competition and one them, Efdal, was selected to advance to the finals, which will be held in Padang during the week of October 19. Efdal will compete against other students from all over Sumatra and will give a speech about human rights and the death penalty. Christopher Linnan co-leading SMA Unggulan CT Foundation’s English Club. 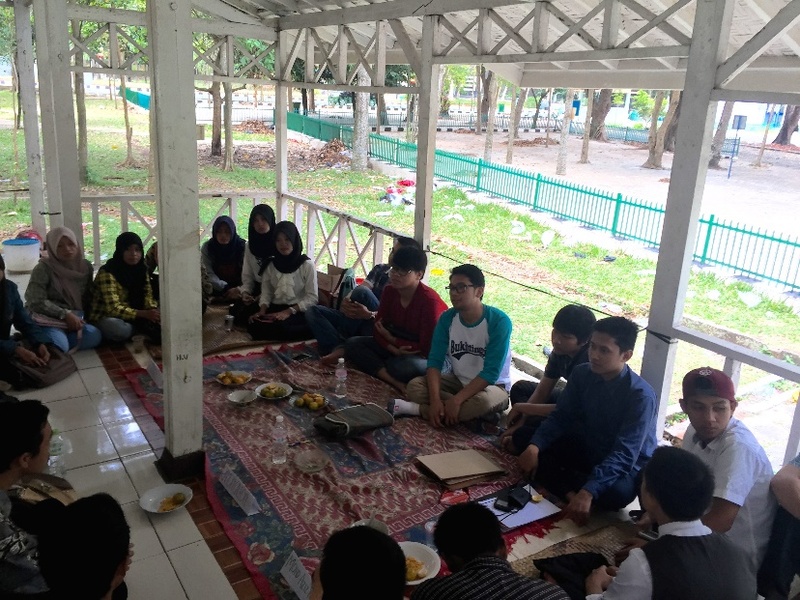 The first week that MAN Wonosari’s English Club met, the 14 students in the group discussed their goals for the organization. On the top of their list was learning about storytelling, speaking English without fear, and public speaking. In order to hone these skills ETA Bryan Thomas decided to host a collection of activities that would allow them to discuss and study storytelling in English. To start, they are watching the Disney movie Mulan in English with English subtitles. They watch the film in 20-30 minute increments and for each installment he generates a vocabulary list defining key terms and concepts. The picture below is from their first viewing session. Before watching the film, they did a pre-viewing activity where they looked over the vocabulary and at the pictures on the cover of the DVD and discussed what the film might be about based on this information. After watching the segment, they walked through the characters, setting, the simple story, and the basic themes already present in the film. Once they finish discussing and re-telling Mulan, a scripted story, they will move onto a silent, short film. The members will then generate their own stories and create basic dialogue based on what they see. After that, they will move onto telling a story as a group using Story Dice as prompts. Finally, they will break into smaller groups and begin creating stories with only a single image as a prompt. 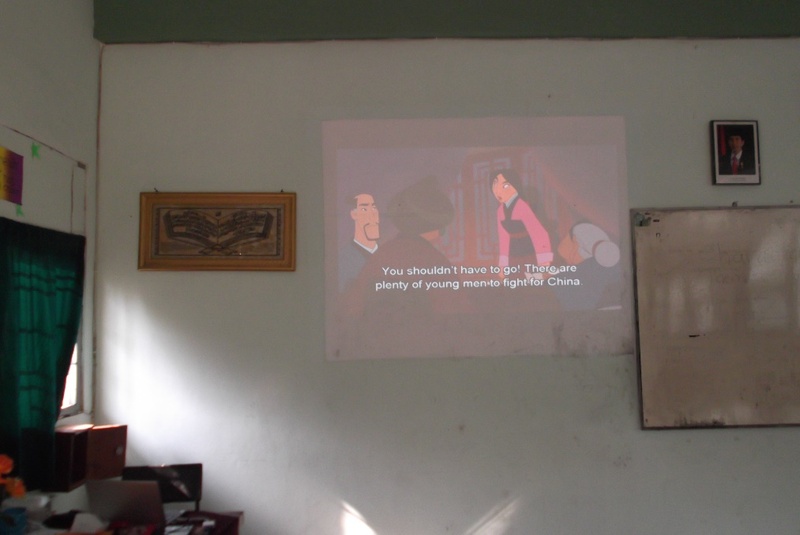 Students in MAN Wonosari’s English Club enjoy a screening of Mulan. 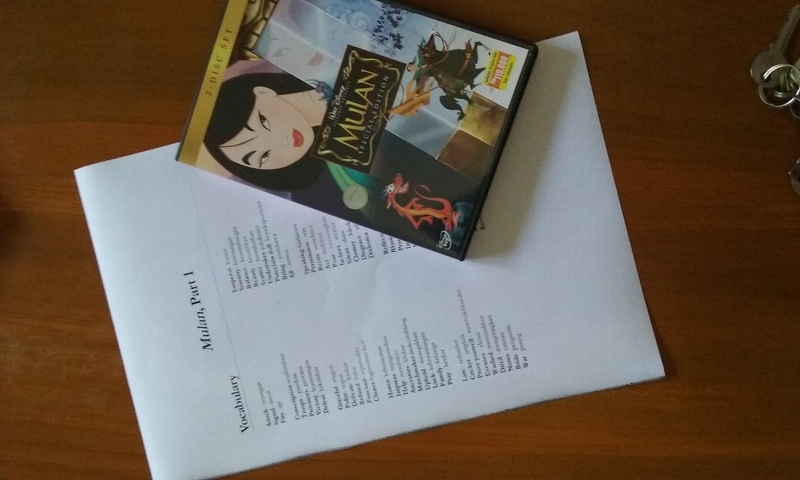 ETA Bryan Howard’s viewing guide and vocabulary list for Mulan. ETA Patrick Dougherty with one of his 11th grade classes on 7 October. During class they played Bingo to learn the past tense versions of many commonly-used irregular verbs. The kids enjoyed playing this game, which was new to all of them. After class, they took a photo because his co-teacher, Awaluddin, and himself had previously planned to wear clothes that resembled the students’ uniforms for Wednesday. The students appreciated this show of solidarity. Patrick Dougherty looking classy with students in one of his classes. 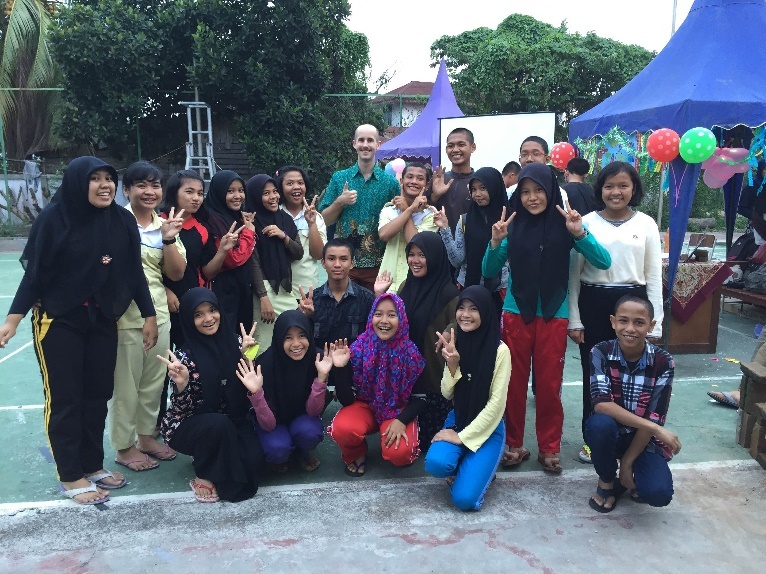 Like many schools in Indonesia, SMKN 6 Yogyakarta had a school celebration for Idul Adha, which ETA Kendra Reiser was lucky enough to join. Idul Adha is the Feast of the Sacrifice and it honors the willingness of Abraham to sacrifice his son at God’s command, demonstrating his complete trust in God. As Abraham was about to sacrifice Isaac, God spared his son and Abraham sacrificed a ram instead. On Idul Adha, animals are sacrificed in remembrance of this story of Abraham and his son. The students and faculty of SMKN 6 had no school on Wednesday or Thursday, which is when Idul Adha is officially observed, so that they could celebrate with their families. However, everyone came to school on Saturday ready for round two of the party. What perhaps makes the school celebration at SMKN 6 particularly istimewa [special] is the school-wide culinary competition. Students cook in teams all morning after the sacrifice of the cows and sheep has concluded and the animals have been broken down. Though Kendra would have loved to be on one of these teams, her cooking skills, or lack thereof, would have ruined the day for whoever was paired with her. Instead, she was asked to judge. She did not need to be asked twice and she essentially ran to the room where the judging would take place. Students brought their food in in their groups and explained their dishes to the judges. When the students realized that they would also have to explain their dishes in English, they worked together to communicate their desired message. With each dish came a story of why the students had selected that course, how they had manipulated the dish from its original recipe, and the reasons behind their creative decisions. One team decided to take the traditional dish of Sumatra, rendang, and make it into a pizza topping and quiche filling; the results were incredible. Another group of students emptied and carved a watermelon as their bowl for their fruit salad. When explaining their food in English, the students did not shy away or giggle as they sometimes had in the past. They had immense pride in their work and were determined to communicate the meaning and intention behind their culinary presentation. Students traded off explaining, when one student would say “apayah?” (what is it? ), another student would pick up and elaborate. In the end, Kendra learned about food from all over Indonesia. She learned about the traditional dishes but also how they could be manipulated into the modern masterpieces of SMKN 6 Yogyakarta. Students at SMKN 6 Yogyakarta are hard at work preparing culinary masterpieces. 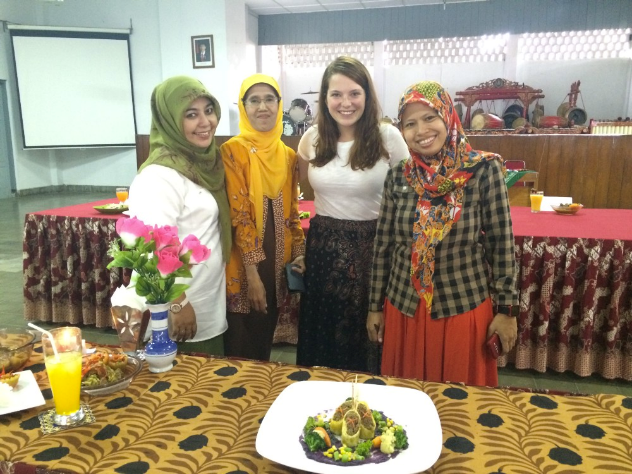 Kendra Reiser poses with fellow teachers at SMKN 6 Yogyakarta. The boarding students, teachers, administration, and ETA Safiyah Ismail gathered on Idul Adha to celebrate and commemorate the willingness of Ibrahim to follow God’s command to sacrifice his son Ishmael. Safiyah Ismail purchased a lamb to be slaughtered and contributed alongside the lambs purchased by the school. The meat from her lamb was then donated to the boarding students, teachers, and villagers in the surrounding community. Safiyah Ismail posing with her lamb prior to Idul Adha celebrations. Every three months, the students at SMKN Binaan have an exposition event to show off their talents and some of the work that the different majors at the school do. ETA Izaak Earnhardt attended one of these expositions on Saturday, October 10. A combination of a science fair, a cultural performance, and a school dance, the event was a fantastic chance to engage with students from the school that he doesn’t usually work with as well as to learn about local Batak culture and see some of the students’ musical talents. Izaak Earnhardt with students celebrating Batak culture at SMKN Binaan. 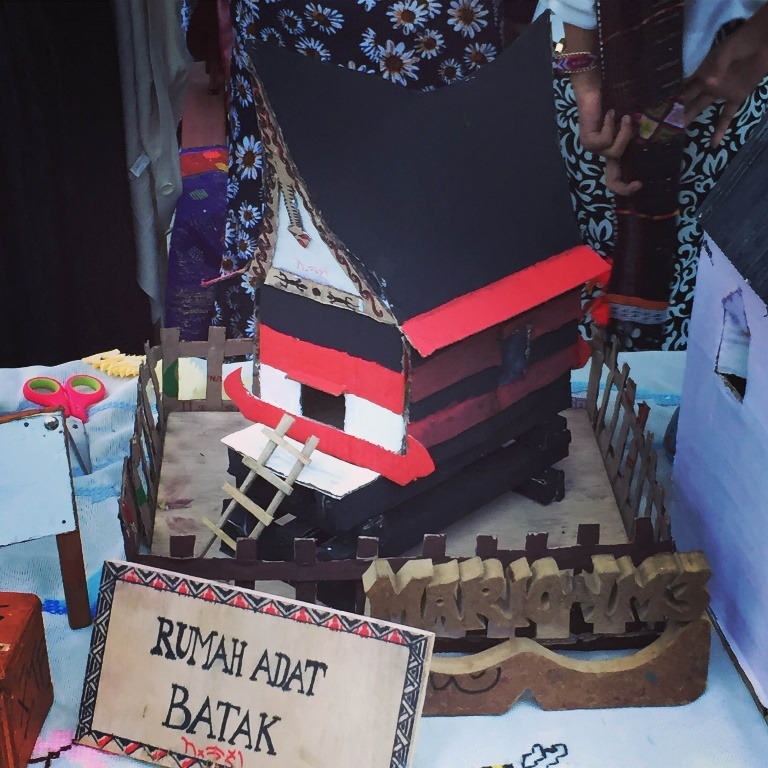 A model of a Batak home. Wedding parties in Bangka have a bit less pomp and circumstance than other parts of Indonesia. People are not required to stay for the entire party but can come and go as they please. At the beginning and the end however, you must greet the bride and groom and their families. The group photo pictured below was taken as the group was leaving (to go to another wedding party in fact!). 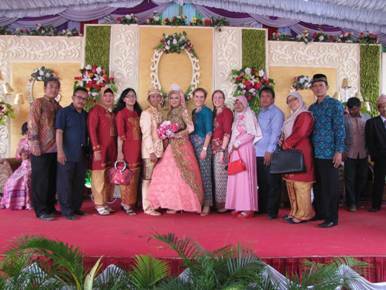 Here ETAs Caitlin Jordan and Kelly Fitzgerald as well as other teachers from SMKN 2 Pangkal Pinang surround the bride, Bu Nisa, and the groom, Pak Despri. Caitlin Jordan and Kelly Fitzgerald pose with the bride, the groom, and an entourage of teachers from SMK 2 Pangkal Pinang. 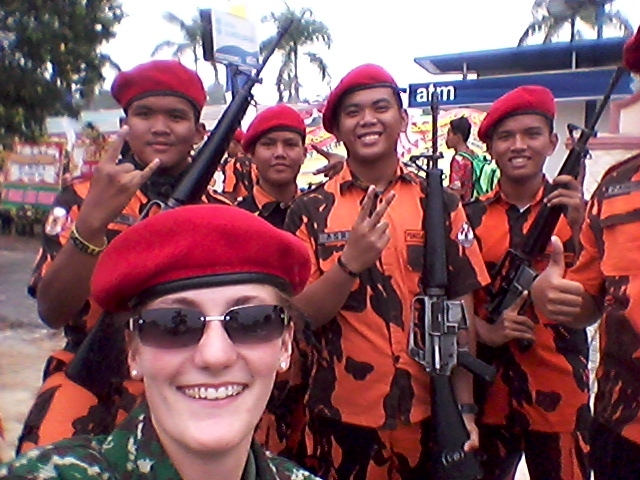 On October 5, ETA Kelly Fitzgerald was asked to accompany her headmistress to view Drama Kolosal, a large-scale play that re-enacts Indonesia’s modern military history in celebration of the Indonesian military’s birthday. Initially seated behind two of the five Bupatis of Bangka, Kelly was later asked to participate in the play. She and her headmistress were then dressed in military fatigues and seated in a Jeep flying the Dutch flag. Kelly played the role of a Dutch General and her students from SMAN 3 Pangkal Pinang played the role of Dutch soldiers. During the play, Kelly’s students used real rifles loaded with blanks to shoot other students playing the role of Indonesian villagers. The act of the play starring Kelly and her students ended with all of them being shot by the Indonesian military. Kelly continues to reflect upon the significance of the play and a lasting legacy of colonialism in Indonesia. Kelly Fitzgerald and her students re-enact actions taken by the colonial colonial Dutch military. Kelly’s participation in Drama Kolosal made front-page news the following day. Thank you to all the ETA’s in Indonesia. You are all there making a difference in the lives of many people young and old. I very much enjoy seeing you all at your sites and sharing your experiences through your words and photos. Enjoy your adventures.